Memorial Day weekend is upon us once again… We remember all those who have served and still serve our nation. Our service men and women have sacrificed so much to protect us with honor and courage, and to ensure our freedom. Thank you for all you have given us. There are many Memorial Day celebrations, parades, and memorial ceremonies taking place in and around DuPage County this weekend. If you are staying in the area for the weekend, you may want to check out one of the local events listed below. The DuPage County government complex in Wheaton (421 N. County Farm Rd.) is having a Memorial Day observance ceremony at 2PM on Sunday, May 29th. The ceremony will be held at the DuPage Veterans Memorial south of the county complex. A Bob Adams from the Midwest Shelter for the Homeless will give a speech following a wreath-laying at the memorial. All are welcome to attend. The village will hold a Memorial Day ceremony near the village hall at 1 Friendship Plaza. The Indian Trail Middle School band will be playing patriotic songs. There will also be speeches by local officials. Attendees will be able to lay flowers to honor our veterans. For more information, please call 630-628-9804. 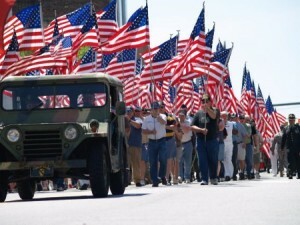 The City of Aurora will is having a Memorial Day parade. The parade begins at noon near South River and Benton. The parade route will continue to Broadway, then Downer Place, and conclude at Middle and Benton. For more information about the parade, contact 630-256-3370. A Memorial Day Remembrance ceremony will be held at 9:30AM at the Saint Paul Cemetery on Lake St. VFW Post 7539 will place flags and have a gun salute. The Legends will perform patriotic music. There is no set seating available, so please bring your own chairs or blankets for seating. 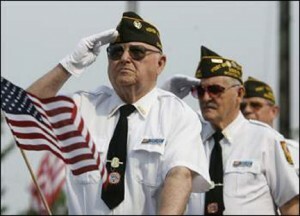 The Elmhurst Memorial Day Parade begins at 9:30AM at York and Third. The parade route continues on to Wilder Park where a remembrance ceremony will take place at 11AM. The ceremony will be held at the Veterans Memorial. Please visit www.elmhurst.org for more details about this event. A Memorial Day ceremony will take place at 10AM at Honover Park’s Memorial Park located at Arlington Dr. and Freedom Way. The event is sponsored by the local Veterans Committee. A memorial prayer will be read along with a short vocal performance. More information about this event can be found at www.hanoverparkillinois.org. Itasca’s Memorial Day parade will begin at 9:30AM at Bryn Mawr/Catalpa. The parade route will continue to 220 N. Maple Street. A short memorial service will be held by VFW Post 5116 following the parade. Parade attendees are invited to attend the service. Bring a picnic basket or purchase food from vendors at the picnic that follows (from 11:30AM to 1PM). More details about this event are available at www.itascaparkdistrict.com. Starging at the Lisle Junior High School at 5207 Center Avenue, the Lisle Memorial Day parade begins at 11AM. The parade route will lead to the Lisle Village Hall at 925 Burlington Avenue. A Memorial Day ceremony will take place at 11:30AM at the Village Hall. Another ceremony will be held at the Lisle Cemetery at 11:45AM. An open-to-the-public community cookout begins at noon, held at the Museums of Lisle Station Park (921 School Street). Call 630-353-3000 for more details about this event. The City of Naperville’s Memorial Day parade begins at 10:30AM. The parade will start off at Jackson Ave. and West St. The parade route will continue on to Central Park (near Benton and Court St.). A ceremony will be held at Central Park at the Community Concert Center. For more information about the Naperville Memorial Day event, please visit www.napervfw3873.org. Villa Park VFW Post 3801 will host a Memorial Day program beginning at 11AM. The program will be held at the VFW post, located at 39 E. Saint Charles Rd. A speaker, patriotic music, and moment of silence will take place in remembrance of our fallen soldiers. A luncheon will follow. West Chicago Mayor, Mike Kwasman, will speak at the Memorial Day ceremony begin held at 10AM at the Oakwood Cemetary (located at Oakwood and York). The City of Wheaton is hosting a Memorial Day parade at 10AM. The parade route begins at Memorial Park (Hale andn Kariskoga). The parade continues on to the Wheaton Cemetery, where a short ceremony take place. More information can be obtained by calling 630-682-0076. The Wood Dale Memorial Day parade begins at 11AM at the Wood Dale Junior High School located at 655 N. Wood Dale Rd. The parade route will continue on to Irving Park Rd. A ceremony will take place after the parade at the Veterans Memorial on Irving Park. More information about this event is available at www.wooddale.com.